Haven’t finalized all of your holiday plans yet? No need to fret, we’d love to see you at Midtown Grille this month! If you think it’s too late to put together a special meal for friends, loved ones, or colleagues – think again! 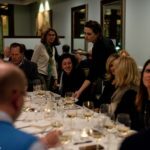 Our team would be delighted to host a meal for up to 30 guests in our private dining room during brunch or lunch and have openings available on both weekdays and weekends between now and the end of the year. And while our evening availability is pretty well booked, please don’t hesitate to inquire and if you’re flexible, we’ll do our best to find an opening for you. For those of you in the hospitality and retail industries, we know this is your busy time of year, too! Our private dining room will have more flexibility during the month of January to treat your restaurant, bar, or retail team to a fun lunch or dinner to say “thank you” for all of their hard work in 2017. Please contact Susan Alibrandi, Private Dining Coordinator for Midtown Grille, at 919-782-9463 or salibrandi@shgltd.com to discuss dates and personalized menu options. >Give the chef in your family the morning or evening off and dine with us on Sunday, December 24 – Christmas Eve! We’ll serve our entire brunch menu between 10 a.m. and 3 p.m., which includes $5 Mimosas and $5 Bloody Marys – brunch favorites! Joining us for dinner? Reservations are recommended for our crowd-pleasing Prime Rib Dinner, including your choice of soup or salad and our special holiday Chocolate Peppermint Cheesecake for $45 per person. Additionally, our Christmas Eve Dinner menu will feature six other entrees of choice. New Year’s Eve dinner is always a popular one for us, so much so that you’ll want to get your reservations in early if you haven’t already! Our reservations for seatings begin at 5:30 p.m. and will run until 11 p.m. This year, we’ll be offering our regular dinner menu, plus special chef’s features, and wine pairings! If you prefer to get your New Year’s eve dining in a little earlier and watch the countdown from home, how about joining us for brunch? From Lobster Bisque to House-Made Doughnuts (with cinnamon, sugar, and chocolate syrup, of course), we have something for every taste bud. Enjoy brunch each Sunday from 10 a.m. until 3 p.m.
Our Midtown Grille gift cards make a great gifts or stocking-stuffers for the foodies or ITB-ers on your list! 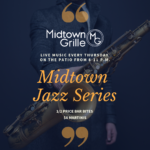 What makes them even better this month is our special offer for you, the gift giver: receive a $20 Midtown Grille gift card for every $100 in gift card you purchase. A few for them and one for you is our way of saying “Thank You” for making Midtown Grille a North Hills favorite for 11 years running. Feel like it’s impossible to plan a holiday get-together around everyone’s busy social schedules this season? Instead of a big party, invite your very best friends (or most valuable co-workers) to join you at the Midtown Grille bar between 3:30 p.m. and 5 p.m. for half-price appetizers! Not only is it wallet-friendly, but a great chance to catch up with friends and loved ones between all the holiday season happenings – no reservations required!